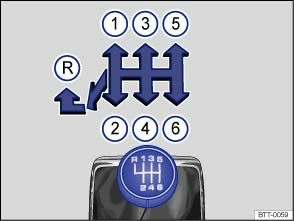 The positions of the individual driving gears are shown on the gearshift lever or . Fully depress and hold the clutch pedal. Move the gear lever to the required position . Release the clutch to engage. In some countries, the clutch pedal will have to be depressed fully in order to start the engine. Reverse gear should only be selected when the vehicle is stationary. Fully depress and hold the clutch pedal . Move the gear lever to the neutral position and push down. 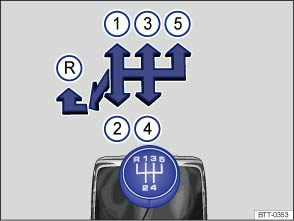 Push the gear lever fully to the left and then to the front in the reverse gear position or . You should always select the next immediate gear when shifting down a gear whilst the vehicle is in motion. The engine revs should not be too high when doing this . Damage to the clutch and the gearbox can occur if one or more gears are skipped when shifting down a gear at high speeds or high engine revs, even if the clutch is not released in the process . In vehicles with a speed limiter , the kickdown function allows the driver to intentionally exceed the stored regulated speed, e.g. when overtaking. When the accelerator is fully depressed, the speed limiter regulator is temporarily switched off when the vehicle exceeds the stored speed. Once the vehicle returns to a speed below the stored speed and the accelerator is no longer fully depressed, speed limiter regulation becomes active again. When the engine is running, the vehicle will start to move as soon as a gear is engaged and the clutch released. This also applies when the electronic park brake has been switched on. Never engage reverse gear while the vehicle is in motion. Shifting gears incorrectly to a lower gear can lead to a loss of control of the vehicle, which can cause accidents and serious injuries. Serious damage to the clutch and gearbox can occur if the gear stick on the manual gearbox is shifted to too low a gear when travelling at high speeds or at high revs. This also applies if the clutch remains depressed and the gears do not engage. Do not rest your hand on the gear lever when driving. The pressure from your hand is passed onto the selector forks in the gearbox. Ensure that the vehicle has come to a full stop before engaging reverse gear. Always fully depress the clutch pedal when changing gear. Do not hold the vehicle by riding the clutch on a hill with the engine running.